A part of Italy called California. Despite the fact that the day began as just about every Saturday does for us, at the Ferry Plaza Farmers Market, we gave the cook the night off. But this is not a review. For that, look here, here or here. Instead, you just get a glimpse. Manila and razor clams in brodo with chorizo. A beautifully composed dish, executed flawlessly. And, it’s as the title above says (cribbed from chef Chris Cosentino), the place isn’t trying to do Italian food just as you’d find it in a particular region of Italy. That’s a fool’s game here — you just can’t ever get it just right. Instead, take the spirit of great Italian food — the most perfect ingredients, balanced just so and use what’s here, what’s great and what’s available now. It will not be what they’re serving tonight in Sicily or Orvieto or Bologna. But at Incanto, it will be good. And with it we drank a Sudtirol Eisacktaler Kerner DOC 2003. From way northern Italy, almost in Austria. It’s a relatively new grape. And no, I hadn’t heard of it before last night either. As a UK wine dealer says, “Nose is intense and aromatic.” Umm, yeah. Intense is the word. If you can find some, try it. Where’d you go Saturday night? Enjoy the jumbos while you can. There are lots of great things about spring. One of the greatest, and I mean that in both the quality and size senses, is the jumbo asparagus from Zuckerman Farms. The Zuckermans grow delicious asparagus. They come in ultra thin, regular and jumbo. I am not an expert on a lot of things, but trust me on this: buy the jumbo. They are tasty, substantial and only here briefly. We’ve prepared them a bunch of ways this season, but simple is best. Cooked in heavily salted boiling water and then dressed with just a little butter and lemon. Tonight we had our jumbos with Autogrill chicken. A couple of years ago we were in Italy. We’d just spent a week on Sicily and were headed north. It was a crazy American style day. You know — we were trying to make good time. Sicily to Positano in a day. Nuts, but anyway. So we’re making surprisingly good time on the Autostrada. But we’ve got many km to go, so in the interest of time, we stop at an Autogrill on the Autostrada. Here, it would be a Burger King. There, it was something completely different. Chicken cooked to order on the grill with just a little olive oil and rosemary. A big, big bowl of fresh strawberries for desert. Now that’s my idea of fast food. So, the full menu: Autogrill chicken on a bed of peppery wild arugula with jumbo asparagus. Tasty and quick for a Friday night. And drank a great Zinfandel with it. 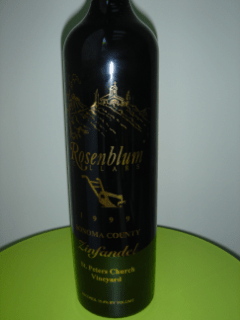 Rosenblum Cellars is our house wine. This one was the ’99 St. Peters Church Vineyard from Sonoma. A big, fruit driven wine. What was good at your house tonight? It’s spring at our house tonight. I must never have really understood green garlic. It’s such an amazing thing. It looks like a scallion, but has a milder garlicy flavor and is spicy at the same time. We’ve been really enjoying the green garlic this season from two different vendors at the Ferry Plaza Farmers Market. Tonight we did trout with green garlic, Meyer lemon and parsely. Because it’s spring, together on the plate with the incredible, sweet, brilliantly green English peas from Iacopi Farm and asparagus ravioli from Zuckerman Farms. And to complete the market theme, we had a 2002 Muscat from Heidi Schroeck in Austria, bought at the Ferry Plaza Wine Merchant. The floral and citrus flavors of the Muscat worked beautifully with the Meyer lemon. Oh yeah, and some strawberries and the first blueberries of the season with a little Straus Farms organic vanilla ice cream for desert. And it’s just a Thursday. This is why I love the Bay Area. The wine is a story all by itself. We were recently invited to a wedding. The groom is from Germany. Stumped for a good gift, we decided to give wine, but not from California. While at the farmers’ market on a winter Saturday, we solicited some ideas from Peter Granoff. We’d been to Germany and Austria a couple of years ago and enjoyed the Rieslings, Gruner Veltliners, Muscats and more in their native habitat. We knew that Peter would have some good ideas for us. Boy, did he. It helps being a James Beard Foundation sommelier of the year winner. Anyhow, one of the wines he suggested for our gift pack was the Heidi Schroeck Muscat. He liked it so much we bought an extra bottle. And that was dinner at our house tonight. What amazing, local thing have you had this spring?